This article originally appeared on saanichnews.com. View the original article in full here. Reece Jacob and Monika Gass of A Buyer’s Choice are proving two heads are better than one when it comes to home inspections. The duo chatted with the Saanich News about the importance of getting a home inspected before you buy it and what an inspector looks for that prospective buyers might not consider. When it comes to home inspections, a Saanich couple is proving that two heads are better than one. 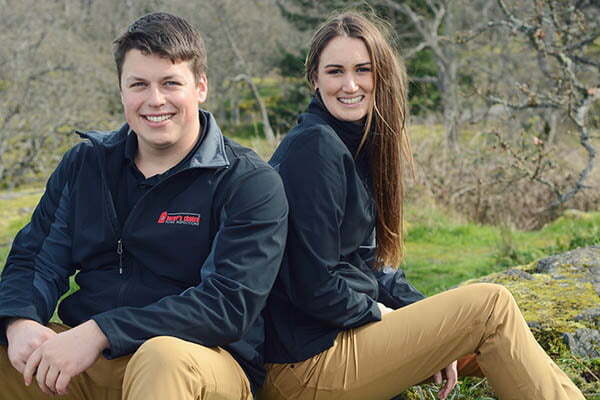 Reece Jacob and Monika Gass are local owners and operators of A Buyer’s Choice, a home inspection franchise with representatives in 15 countries around the world. Together, they tag team home inspections across Vancouver Island, offering a unique viewpoint for prospective home buyers. Through A Buyer’s Choice, the young duo assists realtors, home sellers and home buyers by checking various systems in homes and identifying potential issues. They got into home inspections after Jacob, who worked as an electrician in Victoria for 10 years, started doing inspections with another franchise owner in Richmond and found a new passion for the business. “I really enjoyed doing it, so we decided we would purchase the franchise and start our own business in Victoria,” he said. Inspections typically take three hours, which can be taxing for one person, but they said working as a team allows them to more thoroughly inspect homes and identify issues or potential problems. “For one person, it’s pretty tough to cover the roof, the vents, the flashings, the gutters, the skylights, the decks, the eaves, the grades of the basement – there are so many different systems in a house, and to actually go through every one of those systems in detail on your own is very time consuming,” said Jacob. Inspections can be requested by the buyer or seller, and can be conducted before or after a sale, though Jacob and Gass recommend calling in an inspector prior to making an offer on a home. Jacob said a home inspection can save a prospective buyer a lot of headaches, especially if the home has issues that the buyer may have otherwise not taken into consideration. “There are definitely some problems with houses that people don’t even think about,” he said. “In the attic, for instance, if there’s vermiculite insulation, it has asbestos in it and to remove that is a large cost for a home buyer. But whether a house needs some improvements or it’s ready to go, Jacob and Gass said it’s extremely rewarding to help prospective buyers choose where they’re going to settle down.